Ha!!!!!!! That is not what Logan Airport looks like, or I have been using the wrong terminal all this time. Also really a flight to Boston to New York? It’s not that far via car or bus, or train and then none of that take off the cloak Drama. Basically Rumpelstiltskin is having cultural shock and he can’t use magic. In the character’s past Prince James, Charming/David’s twin, and his lover Jacqueline a.k.a Jack are tasked with tricking a Giant, Anton, who has come to town. Anton is the giant from the compass episode. He thinks they are friends but they just want the beans. James and Jack kill all the giants but Anton destroys all the beans and before the giant leader dies, he gives Anton a new beanstalk seed that can grow more beans. Also to prove James is more of a jerk, he lets Jack die. In Storybrooke, Hook shows Snow, Charming and Leroy, a captured Anton, who is travel size. Anton goes on a tear when he sees Charming/David. Regina and Hook decide to use Anton as a distraction and Regina makes him big. Charming offers himself for the town. Anton tries to crush him but the size mushroom wears off and Anton’s life is in danger. The town saves him and he welcomes him into the fairy/literature fold. Anton tells them about planting the bean to return to the enchanted forest but warns them that it’s what Cora wanted. At end Snow tells Charming home is where Emma and Henry are and she doesn’t want to leave them. Greg also tells Belle that he saw magic too. This was not the strongest episode. It some ways it moved the plot and in other ways seemed to stall. Did the giant need a backstory and did it need a whole episode? Let’s see where it leads but most of it felt like filler. I do like the irony of a giant being an honorary dwarf at the end. Confession time, this episode got spoiled for me BUT oh wow! Amazing twist! You could not have predicted who the true identity of who Neil really was. It fits perfectly and does add to the drama. The plot of this is fairly simple. 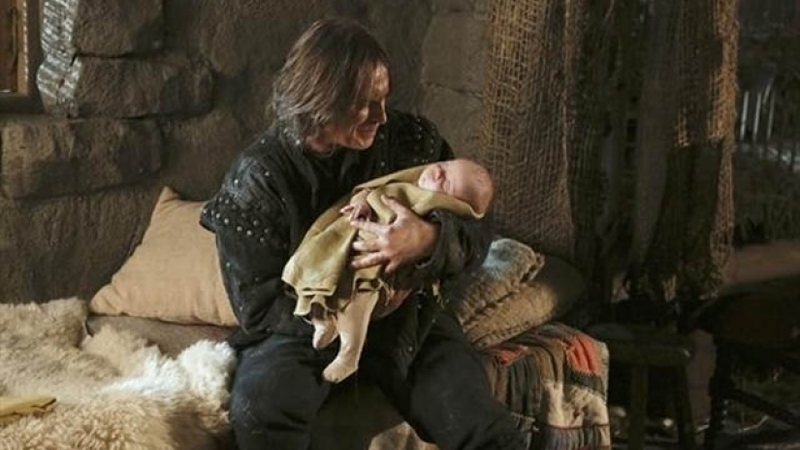 Emma, Rumpelstiltskin and Henry go to Manhattan to find Baelfire and oh boy do they find him quickly. Like Rumpelstiltskin’s globe pinpointed the building. So they find him but he takes off running, Rumpelstiltskin sends Emma after him and to get Bae to speak to him. She catches him but it’s her baby daddy Neal a.k.a Baelfire. Emma questions that if his motivates for being with her and if they were part of the curse. He says no and he wants nothing to do with Rumpelstiltskin. Emma withholds the information that he has a son. 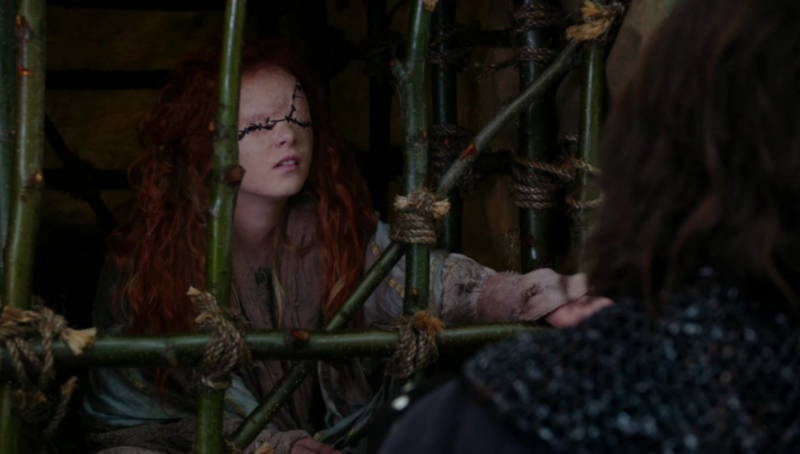 Emma reports back that she was unsuccessful and Rumpelstiltskin breaks in to Baelfire’s apartment. Rumpelstiltskin notices Emma acting weird and starts questioning her but Baelfire shows up to defend Emma against Rumpelstiltskin since Emma didn’t really keep her side of the bargain. When Baelfire see Henry he questions Henry’s age and it’s revealed to everyone else that he is the father. The character’s past portion is about Rumpelstiltskin pre-dark one and post. Rumpelstiltskin is excited to go to the front but while there he meets a seer. She tells him he will die and it will leave his son fatherless. Or rather his actions will lead his unborn son fatherless. And yes they do. Rumpelstiltskin meets her after becoming the Dark One and she tells him that he will reunite with his son but a boy will be his undoing. Rumpelstiltskin says we will have to kill this boy. The boy is Henry. Seems like invented conflict since Rumpelstiltskin’s motivation have been his son the whole time so it seems a little out of character for him to now want to kill his grandson but we’ll see where this goes. Character’s personality change so much in this show that it COULD be in his character. Also In Storybrooke, Cora, Regina, and Hook are on a quest to find Rumpelstiltskin’s dagger so that he will be the one to kill those who stand in Regina’s way of being the sole mommy of Henry. I guess that mean she’ll have to kill Rumpelstiltskin too since he have more of claim on Henry than she does. Does that close adoption thing mean nothing now? Did the curse break existing law? How did that law work? I mean Henry was born in Arizona. Someone MUST have brought Henry to Storybrooke and yet no one could get into Storybrooke prior, unless they were related to the Fairy Tale world. We Know Rumpelstiltskin arranged it but did Regina go? She can leave since she wasn’t a victim of the curse. But Rumpelstiltskin couldn’t leave Storybrooke since he was a victim but he retained his memories. So many questions. How did they get into the town like pregnancy tests or coffee? Does the curse just make commodities appear? Also Gregg saw Regina use magic and sent “her” a video of it. Despite raising all sorts of questions with this possession over Henry plot, this was a great episode. The drama from New York crew was on point. They rest of the episode did feel weak by comparison although that seer was kind of awesome. She reminded of the Harpy in The Last Unicorn. I want to know how she got captured and why? Where is that episode?